The Dubai World default was the catalyst for the start of the EU Crisis. Have we gotten the catalyst for its end? Janet Yellin’s feeding the belief that Fed stimulus is to continue unabated longer than previously expected, possibly much longer. Even if it starts tapering QE, it can dampen rising bond rates via “forward guidance” about not raising them until economic growth and jobs data meet higher standards than previously used. This means 7 speeches by FOMC officials (at least one per day) from Monday to Friday (EST), and the release FOMC minutes Wednesday, will have market moving potential if they provide any kind of surprise, pro or anti- QE taper. European variants of US style QE, the purchase of sovereign or mortgage backed bonds, or another LTRO (Long Term Refinancing Operations), which provides cheap long term loans called LTROs to banks too short of cash to provide sufficient credit to otherwise credit worthy businesses and households. Inflation-anxious Germany has long opposed US-style sovereign bond purchases, and Praet acknowledged that the ECB’s charter prohibits it from financing governments. However he noted there are other ways for the ECB to intervene in markets to keep liquidity up and rates down. EUR losses were minimal, a response that suggests no one believes such steps are imminent. Nonetheless, few believed the ECB’s rate cut last week was anything more than a symbolic “bandage on a shotgun wound,” that would do nothing to revive the EU’s (ex-Germany) stagnant growth and jobs picture, nor would it stave off potential deflation threats recently indicated. The key point is, more radical easing is officially on the menu, despite the objections of Germany, Holland, Austria and other harder money funding nations. The simultaneous rally in Japanese stocks and drop in the USDJPY indicates more than just rising risk appetite. Over the coming months, the Federal Reserve reduce stimulus while the Bank of Japan will consider increasing it in order to offset the impact of the consumption tax. The diverging monetary policies of the Fed and BoJ is another reason for why USD/JPY should be trending higher. The Bank of Japan meets next week and no policy changes are expected. 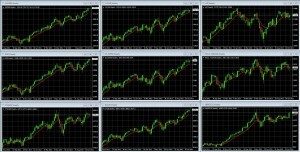 That means the continuation of the three week uptrend in the Yen’s counterparts like the USDJPY, EURJPY, and in Japanese stocks, will depend mostly on whether data from Japan’s big customers such as the US, Europe, and China beat expectations and so provide additional bullish fuel to the risk asset rally. The most market moving event from the EU last week, and perhaps this week too, is that additional future ECB easing is likely on the way. The EURUSD hardly moved in the wake of the November 7th surprise rate cut, and EU stocks responded more that day to the strong US GDP report and its implied QE taper threat. In other words, markets didn’t believe the rate cut would have a material impact. More stimulus was needed, and more would likely be coming. Seehere for details on why. Remember that the EU crisis comes from a combination of too much sovereign debt and bad bank loans, which forced GIIPS governments to go further into debt to help the banks, and the banks returning the favor by buying much of those bonds. Thus the states, especially the GIIPS, and their banks, will stand or fall together. As we discussed last week here, we believe the biggest under-the-radar “phantom menace” for the global economy is the coming ECB bank stress tests, which unlike the prior stress tests of recent years, will be conducted not as national PR stunts, but rather by the ECB, with serious intent to find bad banks and bad debts, so that the ECB or EU doesn’t get stuck with the cleanup bill, estimated at $50 bln (and these estimates tend to prove optimistic). Are funding nations prepared to accept additional financial burdens to stabilize EU banks? Are all EU members prepared to accept centralized bank supervision from Brussels? If there’s no agreement on how to deal with banks that fail the ECB’s stress tests, there won’t be any stress tests and the entire process of centralizing EU bank supervision grinds to a halt. More ominously, the usual solution of print, lend, and extend payback periods to debtors that can’t handle their current debt burden won’t work for more than a few months at best. See our full special report, ECB Bank Stress Tests: Catalyst Of The Final EU Crisis? Accelerating capital account convertibility, speeding up interest rate reform and the creation of a deposit-insurance system. Cutting barriers on private firms entering certain sectors. Encouraging private firms to take part in the reform of state-owned enterprises. Creating more free trade zones in different cities. Letting local municipalities broaden their financing channels, including issuing bonds. Cutting government intervention in resource allocation. Improved protection for property rights. Abolishing the labor camp system. Scrapping residence restrictions in small cities. The bad news: There was no explicit mention of improving transparency or reliability of economic data, nor any indication that these would be coming soon enough to influence markets in the near future. The fed is maintaining its current level of stimulus until at least March 2014, quite possibly longer, and even if it starts, it is unlikely to tighten in any meaningful way, never mind actually raise benchmark rates, for at least the coming 6-12 months. Inflation pressures in all of the above mentioned economies remain low, even too low. Better than expected UK data has raised tightening expectations somewhat, and the PBOC has allowed rates to rise. Not surprisingly then, US, Japanese, and core economy EU indexes continue to march higher or hold steady near multi-year or all-time highs, while UK and Chinese indexes have drifted a bit lower over the past weeks. The coming week’s trends for the main indexes will depend on whether the likely top market moving reports and events for the coming week surprise to the upside. Even if they don’t, many of these trends, as shown on the weekly charts below, are old enough that they can sustain 5-10% pullbacks without sustaining long term damage, hence our bias remains to the upside. That means markets will be more receptive to bullish than bearish data. As we approach the yearend, we don’t think 2013 is going out quietly. We hope to have a year-end outlook article out this week, stay tuned. You’ll be able to find it here if you don’t see it in my usual online hangouts. Reviewing the past week, the biggest lesson for the coming week and beyond is that we could be facing a very volatile year end. The EU faces a year-end deadline for an agreement on handling and funding banks that fail the coming ECB stress tests. The current battle between funding and debtor nations over who controls and funds the process carries very real risk of setting off the next chapter of the EU debt crisis. See here for our in-depth special report on what could easily become the biggest threat markets face in 2014. The US faces a possible renewed budget battle and new risks of damage. Preliminary data on holiday sales has been mixed at best. Of course, expect global stock indexes and other risk assets to move with any materially bullish or bearish surprises to data that is believed to influence monetary policy of the Fed, ECB, BoJ, etc. Fed and ECB speculation will be particularly important for forex markets given that the USD and EUR are involved in over 80% of all currency transactions. ← ECB Bank Stress Tests: Catalyst Of The Final EU Crisis?